Friday’s sharp decline in stocks and Treasury yields recalled the market turmoil in December. It's been a great opening quarter for stocks. The Standard & Poor's 500, a widely watched barometer for the US market, is up almost 12 percent this year, recouping most of the losses we endured in the brutal final months of 2018. But stocks tumbled Friday, raising the question of whether we are in for another bout of anxiety-producing volatility. The fourth quarter sell-off (remember that rare Christmas Eve drubbing?) was caused by fear that global economic growth was decelerating, combined with uncertainty over US-Chinese trade relations, Britain's planned exit from the European Union, and the direction of US interest rates. The new year brought new hope. The Federal Reserve made clear it wasn't hell-bent on raising interest rates, US trade negotiators said they were making progress with their Chinese counterparts, and the job market stayed hot. We got a very nice rally. But pessimism has returned over the past few weeks. Among the reasons: The US payroll report for February showed a surprising drop in new jobs. President Trump suggested that tariffs on Chinese imports, which have taken a toll on some US industries, would stay in place for a while even if a trade deal was reached. The Fed expressed enough caution about the economy’s health that some investors now think it might actually cut rates in 2019. And in the United Kingdom — it's still a mess, with the worst-case scenario, Britain exiting the EU with no divorce agreement, still a possibility. The bad mood was mostly contained to the bond market, where investors bracing for a possible recession sought the safety of US Treasury debt. Their buying boosted prices, sending yields (which move in the opposite direction) lower. The yield on the benchmark 10-year note slid from 2.79 percent in mid-January to 2.44 percent on Friday, falling just below rates on short-term bills for the first time since before the financial crisis. Long-term rates are almost always higher than short-term yields, and this reversal — known as an inverted yield curve — is considered a recession warning if it persists. Meanwhile, interest rates on 10-year German government bonds turned negative Friday after a report on manufacturing activity revealed a sharp decline. Stock investors took notice Friday, sending the Dow Jones average down 460 points, or 1.8 percent. The S&P 500 lost 1.9 percent, and the Nasdaq Composite shed 2.5 percent. It's not all doom and gloom. The US economy should expand by a respectable 2.1 percent this year, according to the Fed. The job market remains healthy despite last month's hiccup, and inflation is nowhere in sight. We will get more clarity on where the global economy is headed this week, as reports on gross domestic product are released by France on Tuesday, and for the United States and the United Kingdom on Thursday. US stocks didn’t move much on Monday. European equities were down across the board. Asian markets had a bad day, with the Nikkei index in Tokyo losing 3 percent and the Hang Seng in Hong Kong off 2 percent. 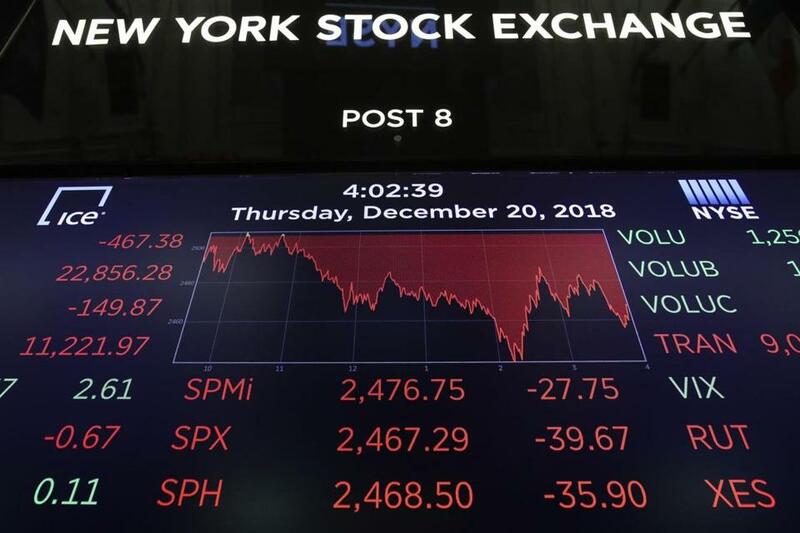 It's too soon to say whether we are in for another correction — Wall Street's term for a drop of 10 percent from the most recent peak. But buckle your seat belts, because chances are good it will be a bumpy ride.